Movement therapies have customarily focused on isolated muscles rather than motion for treatments. However, in reality, the body knows movement not muscles. Over the course of my 12-year career as a massage therapist and physical therapist, my thought processes have evolved, compelling my treatments to become more effective. For example, by placing more emphasis on the nervous system than the musculoskeletal system, I have learned we can create neurological opportunities for change through touch and movement; kinesiology tape can help lengthen the opportunity while also helping to guide movement. Movement therapies have customarily focused on isolated muscles rather than motion for treatment outcomes. However, in reality, the body knows movement not muscles. Knowledge of isolated muscle is necessary and yet it doesn’t reflect integrated movement, as tradition dictates muscles are named for the isolated, shortening action rather than the lengthening action. Prior to my introduction to the concept of taping movement, not muscles, kinesiology taping didn’t fit into my thought process or treatment paradigm. I couldn’t rationalize why I’d tape an individual muscle, let alone distal-proximal or proximal-distal to facilitate or inhibit it. Nonetheless, after my introduction to this new framework of taping motions instead of muscles, lengthening the skin (not the tape) made sense. This taping method fits into my philosophy of modulating the nervous system more than the musculoskeletal system, recognizing the two systems are interrelated and interconnected via a neuromusculoskeletal system. Fundamentals of my practice include understanding the principles of anatomy, physiology, biomechanics, neurology, the mechanisms of pain, and an ability to apply my understanding logically. A working knowledge of anatomy is important as it allows for easier communication regarding the region, and also when tissue needs to be worked in isolation—similar to how a map provides an idea of where you are. Real life is different from a map—similar to how a movement paradigm recognizes individual muscles and isn’t limited to the construct that they solely produce motion instead of controlling the presented forces. The body knows motions and how to control them, while the brain knows individual muscles. Understanding biomechanics is important, because whether pain is biomechanically driven or not, it becomes biomechanical if not addressed because people move around pain, not through it. In these situations, combinations of tissue on one side of a joint and body stay short relative to the other longer side, which remains relatively lengthened. This leads to tissue not getting fully long or fully short or experiencing the pressure changes necessary to pump fluid through the tissue, resulting in lack of oxygenated fluid moving through it. Due to the lack of both pressure change and oxygen to the tissue, physiological and neurochemical processes occur, resulting in acidic responses that can sensitize the nerve peripherally and progress centrally. In these situations, a concurrent cross-linking of the tissue- layer interfaces also occurs, limiting the ability to slide past other tissue and creating a negative feedback loop. Improving biomechanics even temporarily, what current research demonstrates occurs with joint- and most soft-tissue mobilizations, is still valuable, because changing input provides an opportunity to create, temporarily, moments of easier movement. Pain-free movement creates a feed-forward mechanism, leading to more pain-free movement and less anxiety around movement. In other words, changing biomechanics temporarily opens a neurological window of opportunity that can be helpful in changing input, recognizing pain is an output. Kinesiology tape can help the window to stay open longer. For me, an important revelation in practice was that tape affects the nervous system more than the musculoskeletal system. Research demonstrates that various sympathetic processes occur with pain, including inhibitions and reduced somatosensory representation in the painful region.1,2 Therefore, early interventions should be geared toward creating parasympathetic responses and concurrently driving nonthreatening input to the affected region. Put another way, there’s a predictive process associated with pain, including decreased proprioception to the painful region and contributing behaviors to the painful experience. For someone in pain, changing input is important because pain is an output. Touch and interaction with the skin are two effective strategies because the skin is the body’s largest organ and an extension of the brain.2,3 Embryologically, skin develops alongside the brain. In painful situations, often the surrounding skin has a limited gliding ability in specific directions, compared to the other side, while also being more sensitive and more difficult to lift. Movement—specifically, nonthreatening, controlled movement that lengthens combinations of tissue and is based on quality and thresholds—is another strategy to alter input. Combining movement with touch stimulates proprioceptors, improving awareness in space, and also creates input change, which are all important for behavior change and improving movement. While numerous rationales for kinesiology tape exist, the primarily applications are for pain, decompression and neurological re-education, focusing on the nervous system more than the musculoskeletal system. This means that tape can improve tactile acuity and somatosensory cortex representation, which are both important for changing output. Research also indicates that kinesiology tape pulls toward middle, creating a lifting and decompression effect on the tissue underneath compared with what’s around it. Recall that lack of motion results in lack of fluid being pumped around the body, resulting in less blood and oxygen reaching the tissue. When this happens, there’s a cascade of effects that results in a cascade of events that ultimately limit the slide of tissue. For example, I often see people with cervical, shoulder or low-back pain who happen to sit for long periods of time in the same position at their desk. The behavior of extended sitting is a behavior to change, and helping people become aware of pain when in that position will create the awareness necessary to influence change. Simple vertical stability strips along the mid-back can help bring awareness to position, especially when sitting in a bad position that will tension the tape, alter sensation and bring awareness to poor positioning. Another example of how tape can assist in creating behavior is with runners. Oftentimes runners experience pain from a lack of appropriate stride, including cross-over striding or over-striding. The behavior of inappropriate stride contributes to overloaded tissue and possibly a pain response, and so awareness of undesirable running mechanics is beneficial. A piece of tape on the posterior thigh (hamstring) or a piece running down the lateral line when crossing the midline bring awareness when over-striding. In both instances, the tape brings awareness to a movement or behavior that could potentially contribute to pain. 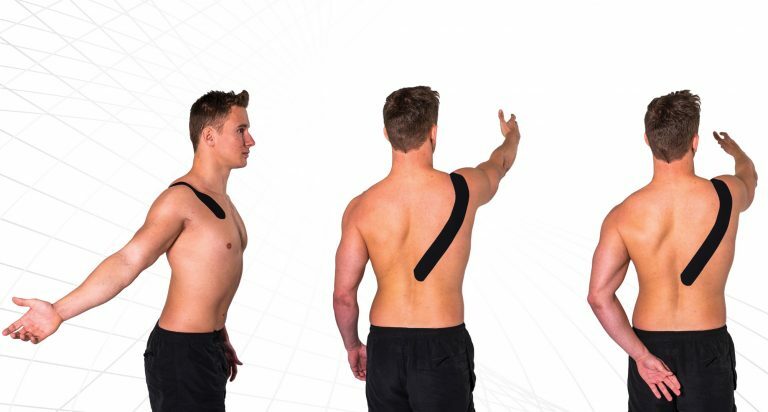 The paradigm of taping movement instead of muscles is consistent with the concept of affecting the nervous system more than the musculoskeletal system, although it is an interrelated spectrum. When working with people in pain, it’s important to change input, including touch, vibration, pressure, tension, temperature, words and emotions, because pain is an output. Therefore, creating strategies that include as many input changes as possible is a good way to deal with pain in initial stages of intervention. Using kinesiology tape for movement is a great adjunct for manual therapy, because the framework of application is grounded in an understanding that the body knows movement. Adam Wolf, PT, LMT, FAFS, is co-owner of REAL pt in Chicago, Illinois. His professional career spans nearly two decades and includes clinical, management, consulting, education, performance/strength and conditioning, as well as ownership roles. He is the author of REAL Movement: Perspective on Integrated Motion & Motor Control. Wolf is also a RockTape Functional Movement Techniques instructor who presents to fitness and rehabilitation professionals internationally.